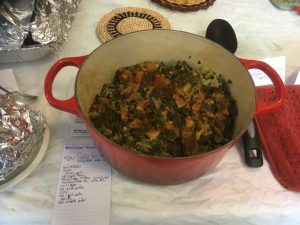 Caldo Verde is a Portuguese soup, translated as “green broth.” I was looking for an entree with more or less its ingredients that would work on a plate not in a bowl — for a potluck Thanksgiving. The surprise was how very quickly this comes together. My improv was a hit, so without further ado here it is. The ado is below the recipe. Preheat oven to 400 degrees. Line a baking sheet with parchment paper or lightly grease it. Place cubed potatoes and onion chunks on it in a single layer and bake 30 minutes. The taters and onions will have spots of brown and be nearly cooked. Place a Dutch oven or large (4 quart) saucepan on medium heat. Add a tablespoon or less of oil. Brown the sausage pieces 4-5 minutes, stirring occasionally. Remove the sausage. Add a few drops of oil to the pot then the garlic and cumin. Stir these constantly 30 seconds then while standing back add 2 cups of hot water. Stir in the optional broth powder, salt and flavorings. Add the greens, rinsed beans and the browned sausage pieces. Stir. Add the roasted potatoes and onions. Reduce heat to medium low, cover and cook 10-15 minutes, stirring in up to 2 more cups of hot water to keep from boiling dry. The stew will be cooked at this point so it’s time to “correct” the spices. Take out a bite or two, let it cool a bit. Taste and add a little more of what might be missing that your guests would enjoy. Optionally to garnish, drizzle the top with 2-3 teaspoons of olive oil then sprinkle with smoked paprika. Caldo Verde is a soup where the potatoes are liquified. For that effect, add more water for that consistency and mash the ingredients against the side of the pot so most of the potatoes fall apart. This is a one-pot meal, nutritionally. A salad would be a good side to it. Step 1 is optional. Roasting deepens the flavor but can be skipped. Also, the roasting can be done the day before then refrigerated until needed. Yukon gold are similar to good ol’ Idaho white Russets; sweet yam potatoes won’t work here. The greens don’t need to be fresh, but if you insist, knock yourself out. Your home-cooked beans will be fine. The liquid from canned beans or from your having cooked them, called aquafaba, can be used elsewhere as an egg substitute. Vegan sausage — lots of tasty choices. A more peppery one like vegan chorizo would be more authentic; I picked a gentler kielbasa because of the potluck guests. For convenience, the sausage can be replaced by a second can of beans and a little more spice added to the pot. Serves 6 hungry people. This recipe can be doubled but not the flavoring spices, add more at the tasting stage. Source: Forks Over Knives website recipe, which cites the recipe from the 21-Day Kickstart plan of the Physicians Committee for Responsible Medicine. The pre-roasting for flavor comes from PCRM.